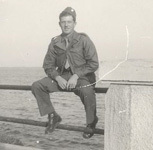 My father was a WWII veteran and served in North Africa and Italy. 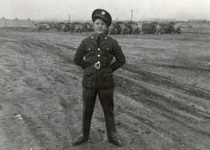 He continued his service for 21 years and retired at the rank of Sergeant First-Class, E-8 in 1963. 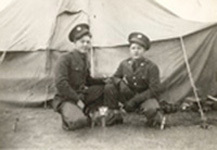 He always liked to drive trucks and upon his retirement from the Army, he took this skill and began driving over-the-road for Mayflower Moving and Storage and later for International Transport. Regretfully, he left us at the age of 59 in 1978. Upon the death of my mother, I found some notes and a Timeline that my dad had written while he was stationed overseas. 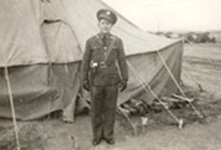 He had been an ordnance man working with the 15th AAF. I have a few pictures from that time and will do more research as time allows and try to get this area of the site updated to reflect what I have. 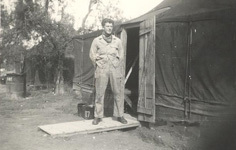 The pictures posted are of my father, Norman P. Johnson, his brother Fred who was killed during the Alabama Maneuvers, and some of his friends. 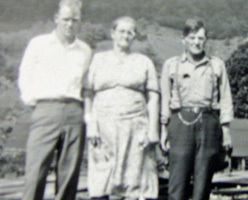 The last three pics are of dad with his sister Joyce and my mother, Dorothy. If you have any knowledge or an interest in this subject matter, I'd love to have you contact me. I'm sure that there are many stories that have gone untold. 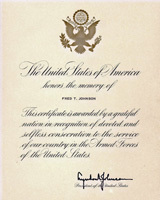 It was nice of President LBJ to thank my uncle Fred for his service. He was only 24 years late but at least the job was done. As I noted earlier, Fred Johnson was killed while on maneuvers in Alabama in 1942. As I continue to reminisce about the past and some of the conversations that were had, I remember one in which my mother mentioned a ship blowing up while my father was in Italy. That ship was the Liberty ship John Harvey that was docked in Bari, a port that was located on the eastern coast of Italy and a key supply center, on December 2, 1943 and was loaded with mustard gas. The port was bombed that evening by Junkers JU-88 aircraft and struck the John Harvey. This ship was a secret as the allies were not planning on using any chemical agents unless this type of warfare was initiated by the axis. The ship was being brought forward towards the "front" as a precaution. It was only by chance that the chemicals were released into the environment. The medical civilian and military authorities of the local area knew nothing of what had been released and were totally unprepared for the incident. I don't know if my father was at the harbor on the evening of the bombing or was called in to do clean-up work afterward. I'll have to review his records. Needless to say, there were many who were affected by this chemical accident. The chemical disaster was kept secret until it was declassified in 1959 and quite obscure until 1967. My father was always a part of the Chemical Agency of the U.S. Army. I must question, at least in part, if this event was not a factor in his premature death at age 59. As with most men from WW2 and also from Vietnam the Vietnam era like myself, smoking cigarettes was prevelant. However, he had issues with his lung function in his early forties. Again, I am placing no blame as I know not, in fact, if he was truly involved with this incident. Considering what I have learned about military cover-ups that were made at their time for probably good reasons, I will always have my questions. 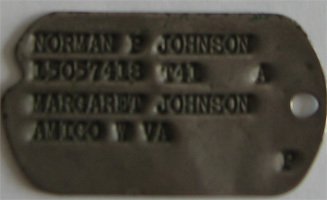 I got a call in August of 2009 from my cousin, Ed Vaughn, Jr. asking if I'd like to have my dad's "dog-tag" that he'd found amongst some family memorablia. I really didn't have to answer his question. Notice that his mother's name and hometown are enscribed. Also shown are his service number (as an army brat I had this memorized), Rank (T4 looks like he was a technical E-4) and blood type "A". This sailor was amongst the photos of my family. His identity goes unknown. 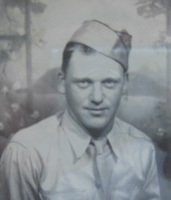 I include the picture of Coy (without uniform) here as he was a gunner on United States' ships. These convoy ships (Merchant Marine) were manned with "Army" personnel. I found the uniformed picture later. Through conversations with his daughters, it is my understanding that he made 27 trips across the Atlantic. This kind of duty, I am told, was some of the most dangerous to be had.